This has very little to do with actual cooking or snacking, but since the conversation did happen in the kitchen, while I was teaching a kids summer cooking camp, I thought it’s only fair and appropriate that I share it with you. On the second day of camp, when the kids felt already quite feisty and comfortable with me, the following convestaion took place between me and a 10-year-old boy. Let’s call him Peter. Peter: do you have a kid? Peter: do you have a boyfriend? Peter: wow, you say “no” a lot! Me: well, you’re asking, I’m answering. Peter: do you have a crush on someone? Peter: is that like being in love? are you going to marry him? Me: let’s go cook something! I wanted to share new culinary perspectives with you and thought that one way to do so was to host a guest blogger. Alex of Yumsandloves replied and here we are! Hope you enjoy her post – I love beets and am always looking for a new recipe for this sweet, earthy root vegetable! If you want to be the next guest blogger here at Snacking in the Kitchen, please let me know! Hi, I’m Alex and I blog at yumsandloves.com. 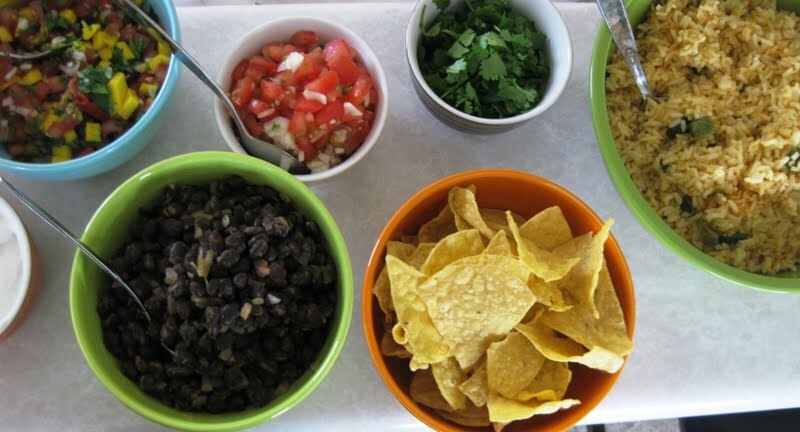 My blog is just that… yummy food and things I love. Although Anna and I have never met, I can tell we have a lot in common. The number one commonality…our love of food! I have been following Anna’s recipes and restaurant reviews and I’m happy to share mine with her. I told her one of my ideas was to make something from ingredients at one of our local farmers’ markets! Thanks Anna for giving me the chance to be a guest writer on your blog! On a Sunday morning, darling hubby, our French Bulldog, and myself headed to Ballard for the Farmers’ Market. I was leaning towards making a salad! When I saw beets, I knew that would be the base of my salad. We both love roasted beets and enjoy eating them in our meals. While walking, we brainstormed some ideas and then…Rainier cherries. Yum! I grabbed about a 1/2 pound of cherries and had to resist eating the entire bag right there! 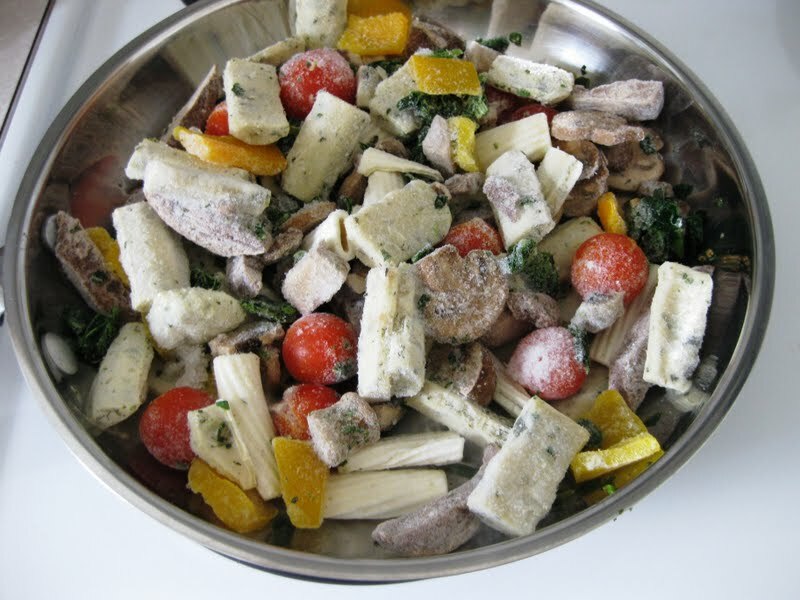 Next item: goat cheese – a nice container from a farm up in Lynden, WA. 1. Preheat oven to 375. Wash beets and remove leafy part. Put beets in a foil pack and drizzle with olive oil. Sprinkle with salt and pepper. Roast beets for about an hour, or until easily pierced with a knife. Once cooled, peel and dice the beets. 2. Cut cherries in half and remove pit. 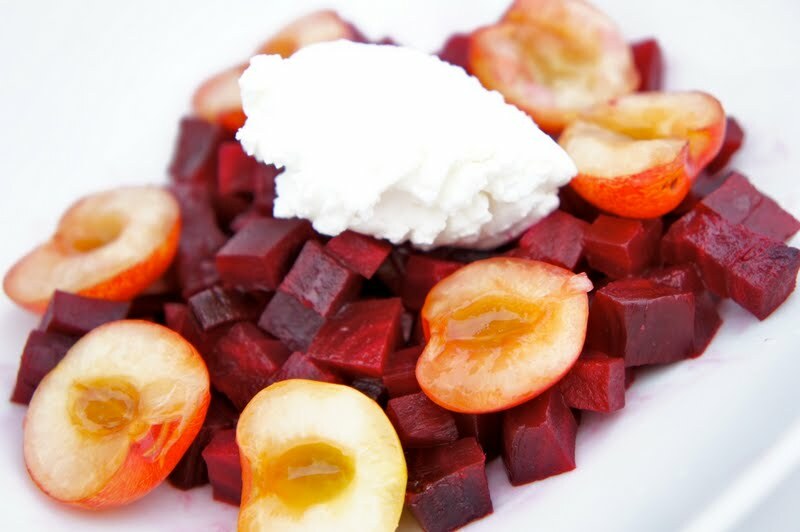 Arrange beets on a serving dish and sprinkle with cherries. 4. Whisk together vinegar, olive oil and honey. Add more honey if desired. Drizzle the dressing over beets and cherries. I tried to get some of the dressing inside the cherries to add extra sweetness. 5. Top the salad with a generous dollop of goat cheese and dig in! 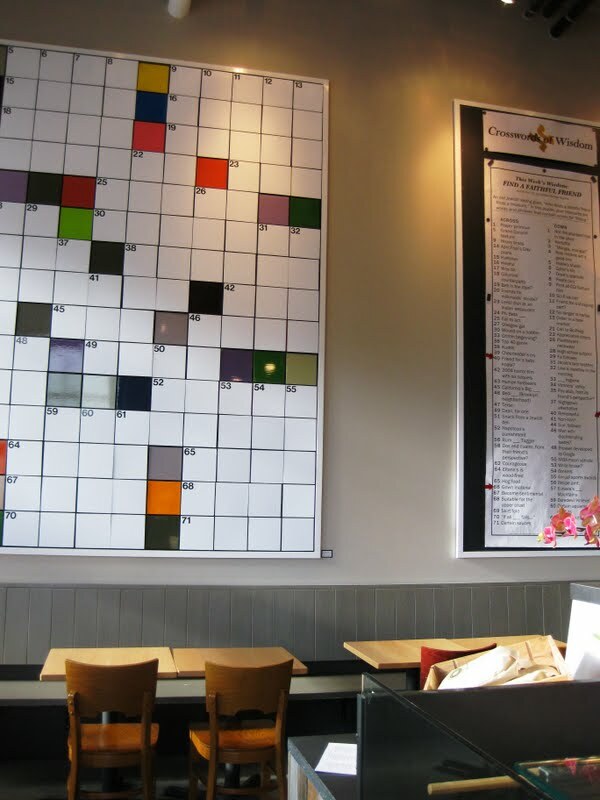 Have you gone out on a perfect blind date? You meet, you see, you talk, and you fall in love. You can’t wait to see that person again. Sounds familiar? 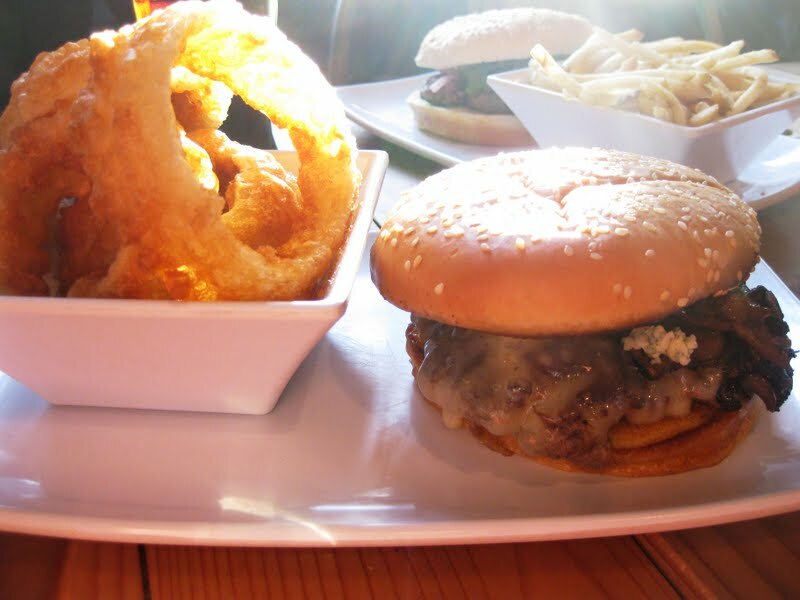 That was my experience at Uneedaburger – a Fremont burger joint in Seattle. 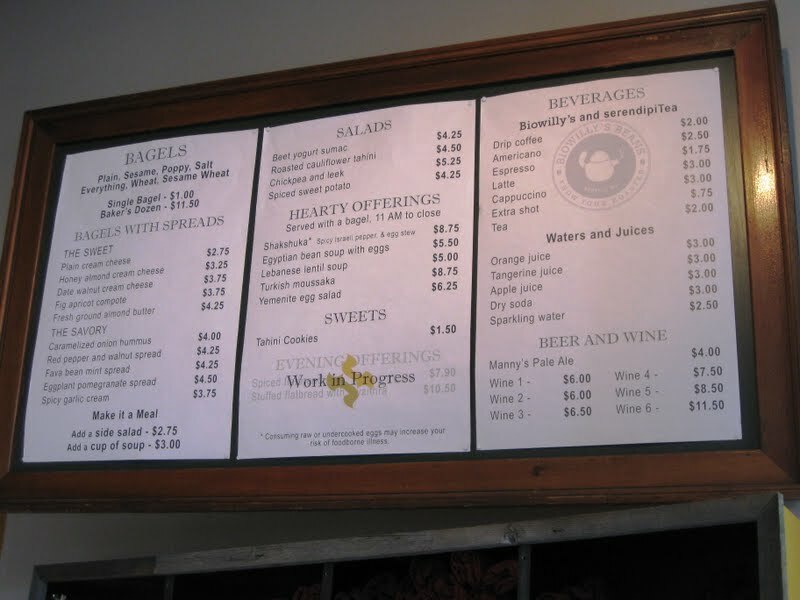 I love their buttered buns, they were crisp and so decadent. They perfectly held a medium rare beef patty, covered with charred chile peppers. I must’ve talked Uneedaburger so much that people started asking me if I was working on commission – I wasn’t, I just wanted to share my burger joy with others. So when it came time for my friend’s birthday celebration, I suggested we go to Uneedaburger. As I waited for her, somewhat impatiently, sitting outside at one of the benches, I had butterflies in my stomach. Would the 2nd time around be just as good? Memories of some of my second dates filled my mind and my heart. Remember seeing someone for the second time and feeling the original magic disappear right before your eyes? I was silently saying the prayer that the same wouldn’t happen with my new favorite burger joint. 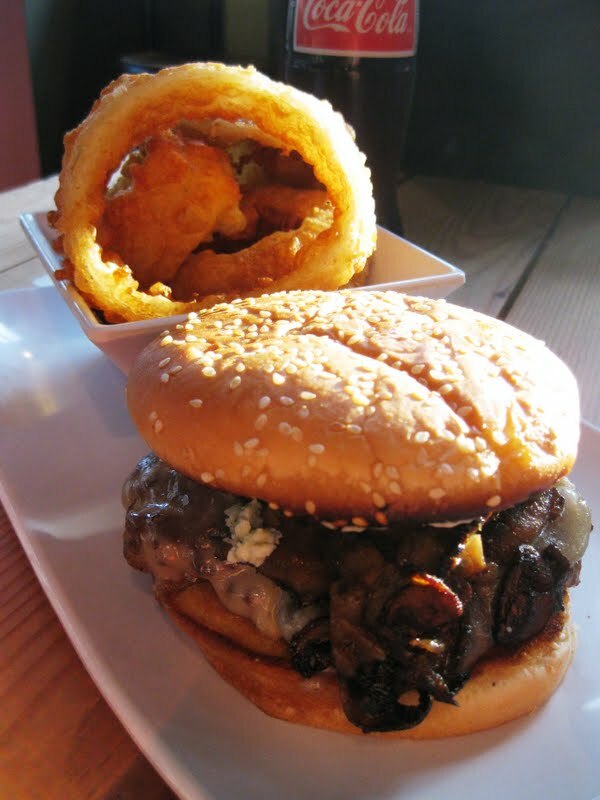 This time around, I chose to order #8: Crimini mushroom burger with procini mushrooms, black truffle salt, shallots, and Gruyere cheese. Sounded amazing, but I wanted a stronger punch from the cheese, so I asked for Blue. Medium rare please, with pickles on a side. The burger was slightly overcooked and needed a bit more seasoning. I was slightly let down – 2nd date, what are you doing to me? The onion rings, however were perfect! 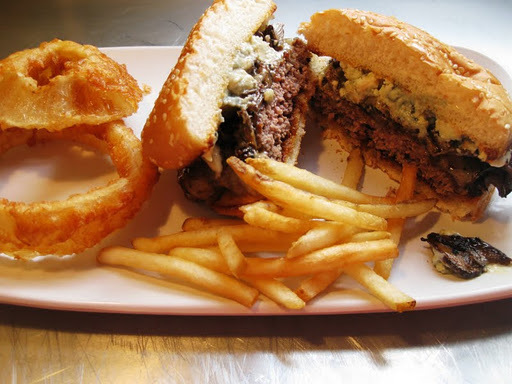 Greasy, crisp, with sweet onion hiding inside. They had a certain glow to them! My friend chose the same burger I had on my first “date” – #5 Sonora burger with roasted chili relish, and cilantro (no cheese for her). She was expecting a bit more heat from the relish and more cilantro flavor. This was the first year I decided to give up leavened foods for Passover. Before you proclaim how proud you are of me, I should warn you, that throughout the holiday, I did keep up with my consumption of bacon and shell fish. Shame on me. Please don’t judge. Regardless, giving up bread, pasta, and baked goods wasn’t as hard as I thought it would. I might’ve also lost a pound or two, which was definitely a bonus. And I also discovered the beauty of matzo sandwiches. 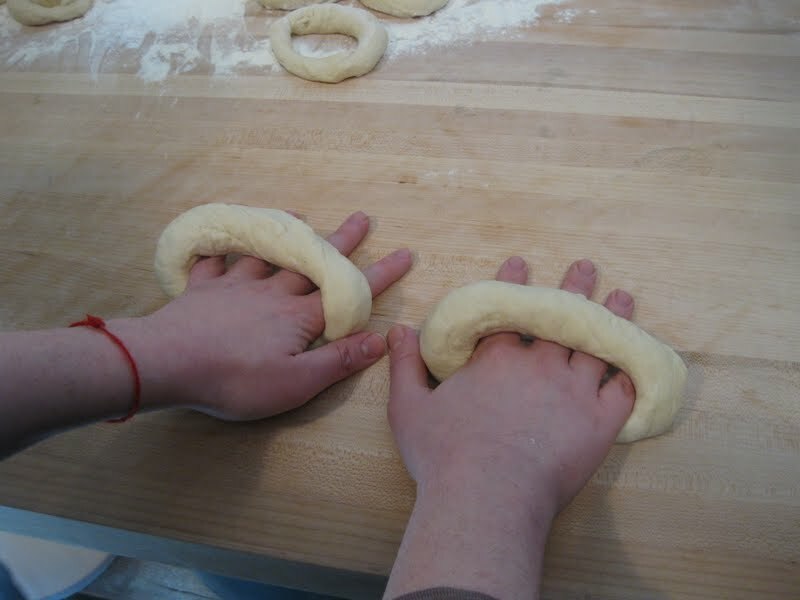 When it was time to return to bread, what could be a better option than bagels? Enter Josh Furman, the man behind fabulous events hosted by Jconnect. On April 26th (I’m slightly behind in my recap), JConnect boys and girls, and bagel lovers united at Eltana to nosh, mingle, and learn about the bagel making process. 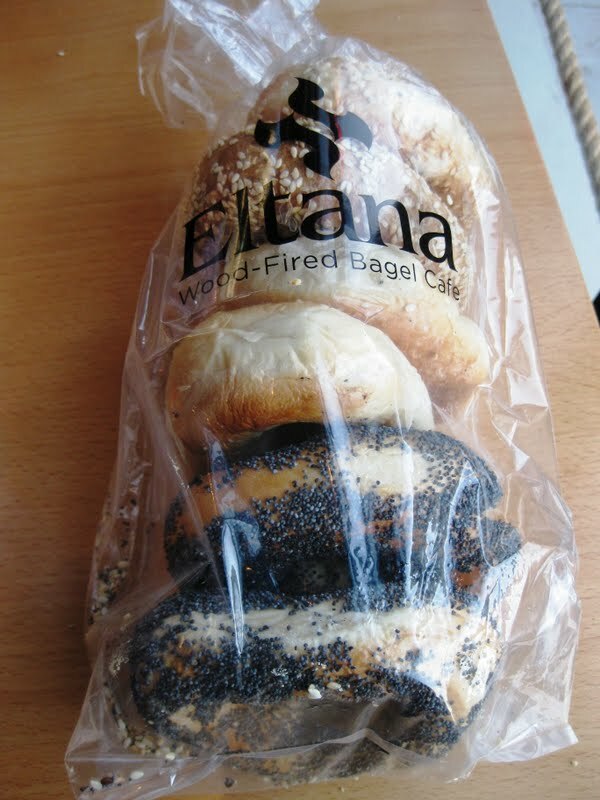 Before I got to try out the bagel, I got the tour of the kitchen, learned about the bagel making process and discovered what makes Eltana bagels different from the competition. 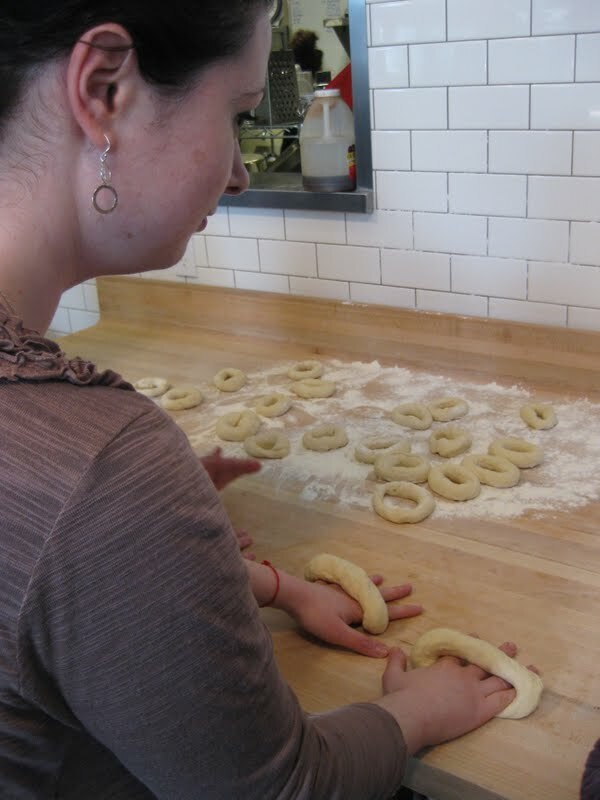 Etlana serves up Montreal Style Bagels in a Sephardic style. 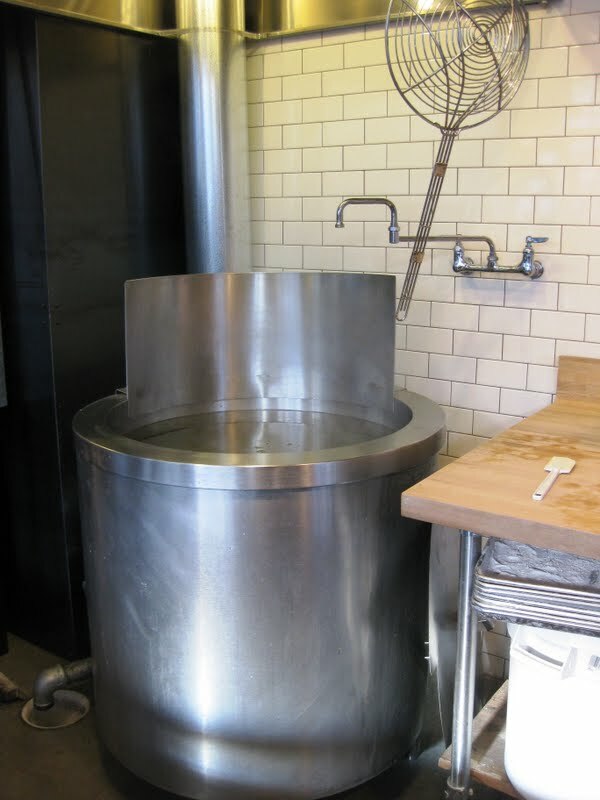 The bagels are hand rolled for 2-4 minutes and then are boiled in honey water. 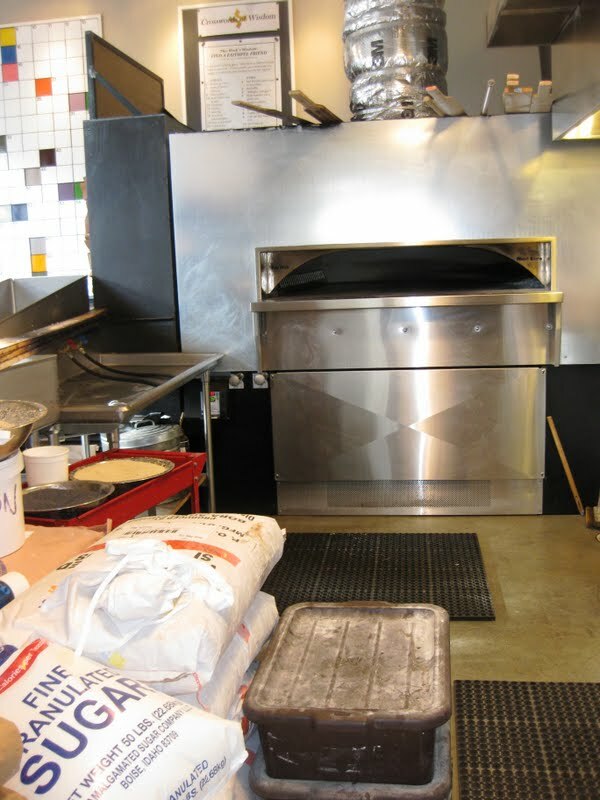 They are seeded on both sides and then finished in the wood fired oven (they use apple or cherry wood). 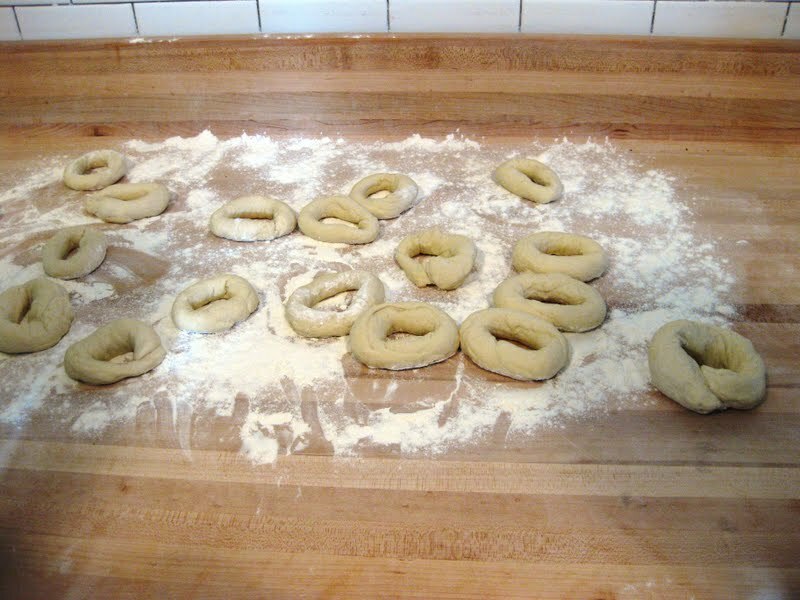 The Montreal style bagels are sweeter in flavor because the dough has sugar, which traditional bagels don’t have. 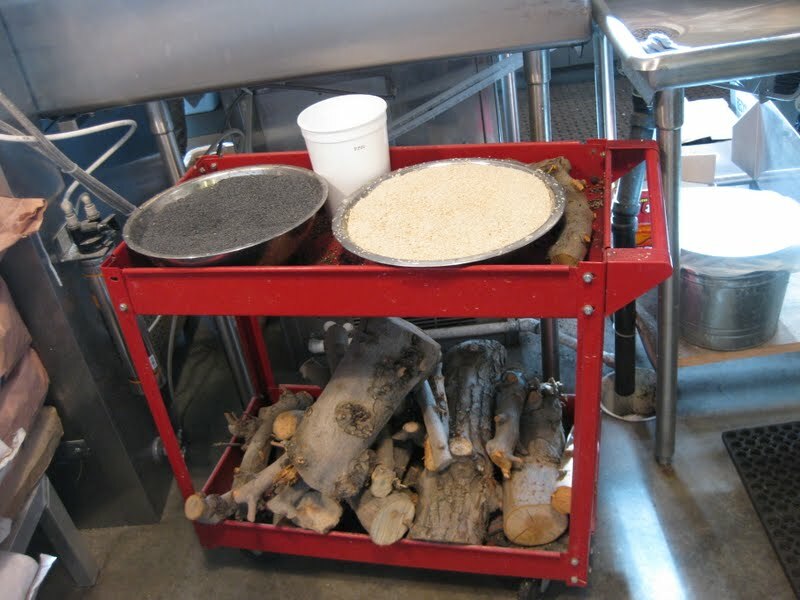 The bagel making process: mixing, boiling, baking in a very hot wood-fired oven. And then, we got to eat! One word: delicious! I wanted to stand there and keep on eating the spreads. 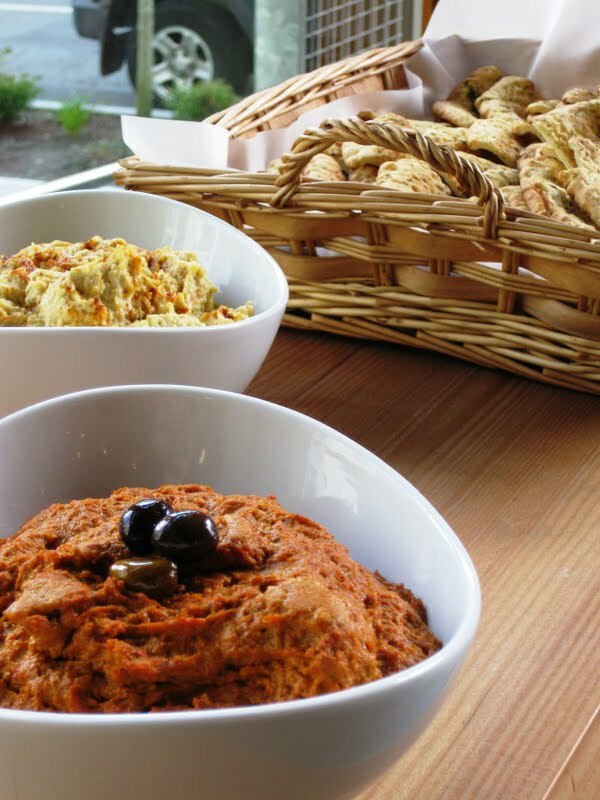 The red pepper & walnut spread was my favorite. And the bread was definitely worth the wait. I hope you all know how obsessed I am about sweet potatoes. 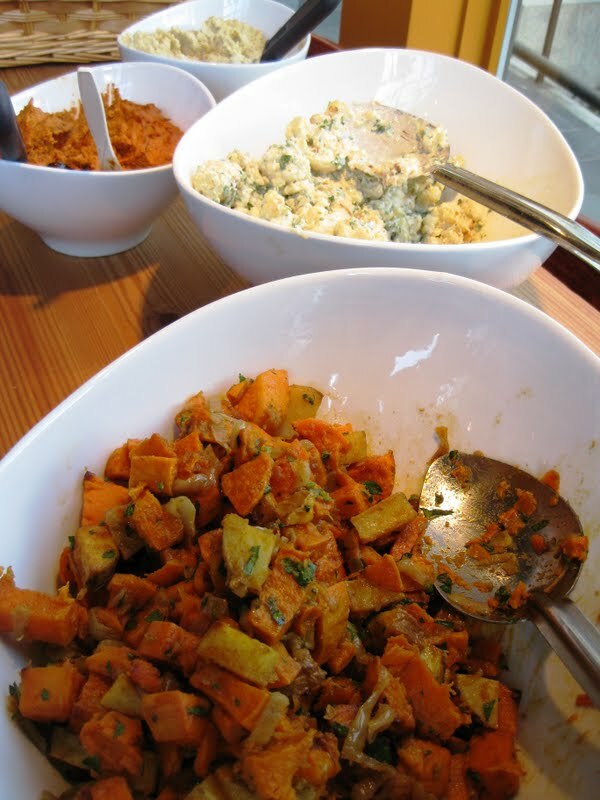 Skip the sweet potato pie and go straight for the savory version with lots of spices, cilantro, and lime. The Eltana version came close – it was nice and spicy. 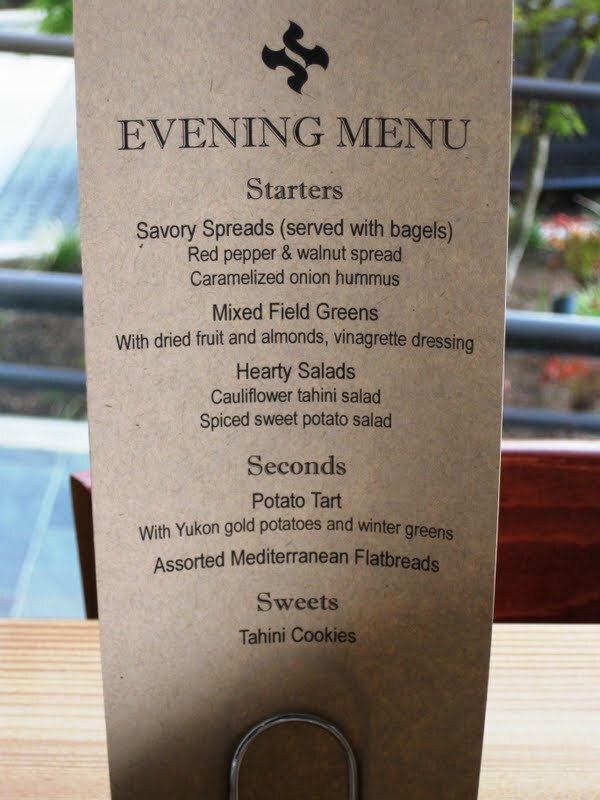 I loved that they used the traditional orange and the less common yellow varieties of sweet potatoes. With the cauliflower tahini salad, I wish the dressing wasn’t as overwhelming. I like the mild flavor of cauliflower, and unfortunately it got covered up by the tahini dressing. I wish I had one of these bites right now. They would be perfect hot, straight out of the oven, at room temperature, or even cold, perhaps with a side of sour cream. 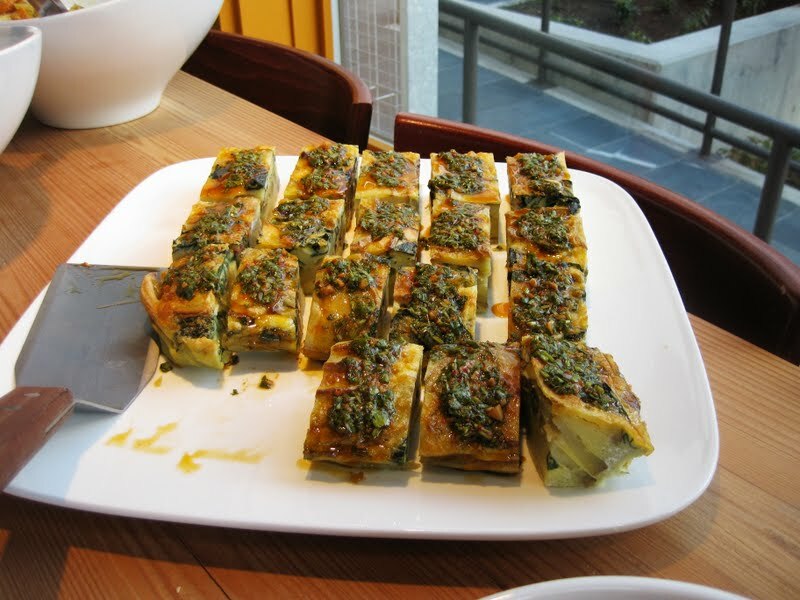 Similar to the Spanish Potato Tortilla, I like the fact that Eltana added greens to this version. By the time dessert arrived, I was pretty full. There might’ve been a few second helpings of flat bread and bagels. But I wanted to give Tahini cookies a try. 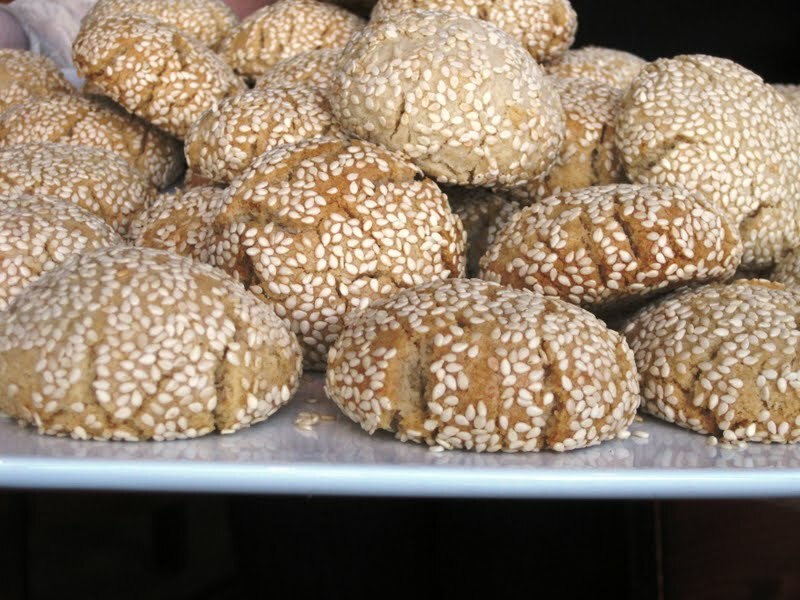 The cookies reminded me of halva. Very strong in sesame flavor. Sweet and dense. I wish I had a cup of coffee or tea to go along with these cookies. 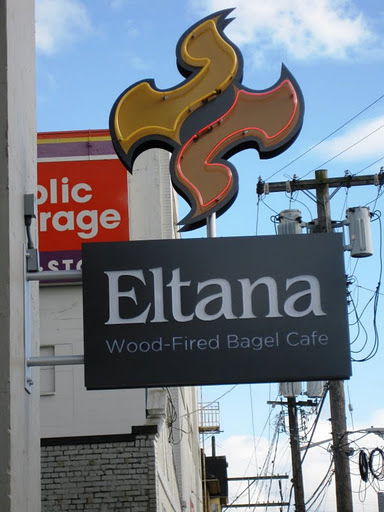 More info from the website: Eltana was created by Stephen Brown and Daniel Levin, to make a deliciously different, hand-rolled bagel — and to bring it directly to you with flair, warmth and soul. We love the food we make. Not just the bagels and flatbreads hot out of the wood-fired hearth, but the simple and memorable street food from the Eastern Mediterranean that we serve to accompany our breads. 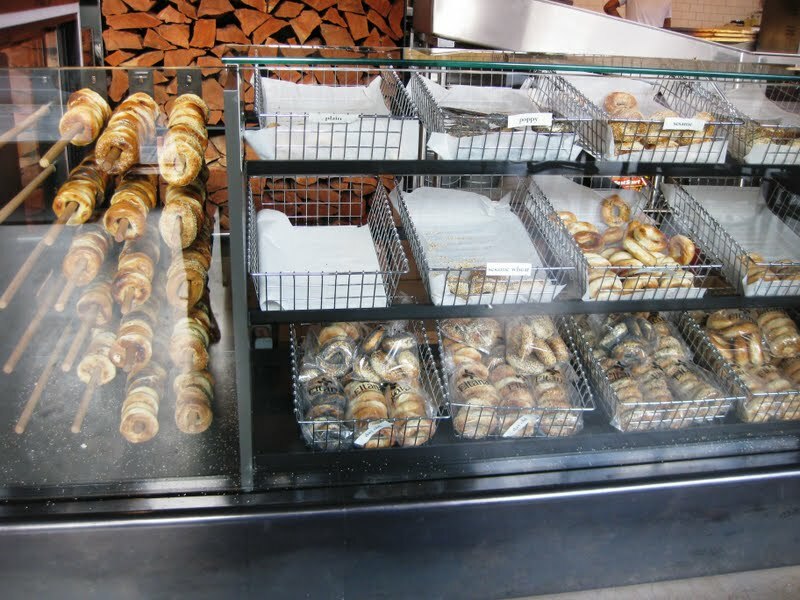 Pick up a bag of bagels on your way out. On my day off, I found myself back in the kitchen testing yet another recipe for Robyn Webb. 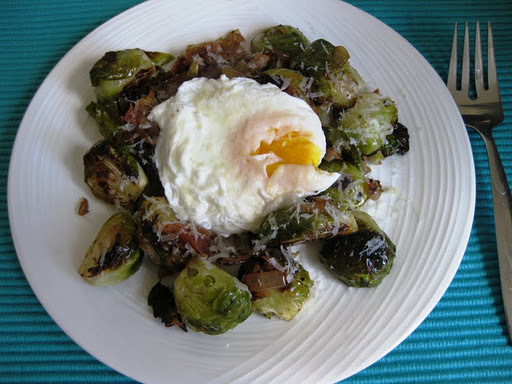 This time I was roasting brussels sprouts with sauteed onions and pancetta. Other than setting off my fire alarm for 5 long, painful minutes, the recipe came out well. I love when the house smells like pancetta or bacon. Not wanting to waste a hot oven, I wrapped beets in foil to get roasted and combined chicken thighs, carrots, and onion to be baked. At the end I was hungry. Having a bowl of brussels sprouts on their own didn’t seem appropriate enough. That’s when I reached for the last egg in the refrigerator, got it poached, and served on top of brussels sprouts with a shaving of Parmesan. Satisfying, delicious, easy, and quite beautiful! What’s the last meal you cooked just for yourself? There isn’t much in my freezer. Sure, I have a few trays of ice, and some individually frozen skinless, boneless chicken breasts. There’s also a bag with celery sticks (to be used for mashed potatoes) and some frozen bananas (that are more likely to be thrown away than being put to use in a banana bread). 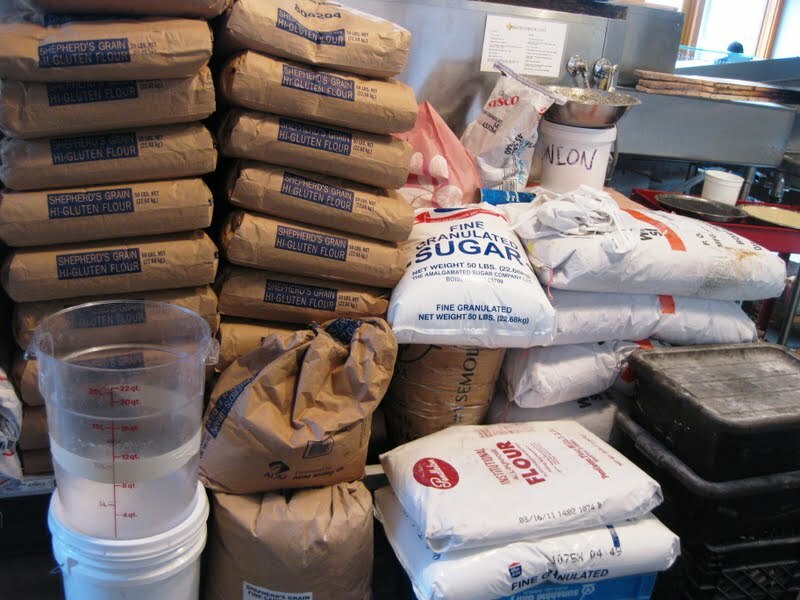 I also keep nuts in the freezer, so there are a few bags of almonds and pecans – the pecans are from one of my students whose father has a pecan tree in his yard in Texas. What you would never find in my freezer is a frozen entree meal. Afterall, I cook, I eat, I microwave only to reheat. But, when I received a coupon for a free Bertolli frozen meal, I decided to give it a try. And this brings us to an evening when I was too tired to cook, and too hungry to wait for Thai take out. So instead, I reached inside of my freezer and grabbed a bag of Bertolli’s Mediterranean Steak, Rigatoni & Portobello Mushrooms. According to the bag, all you need is a skillet with a lid and 10 minutes. I had it all, and was ready to get “cooking”. 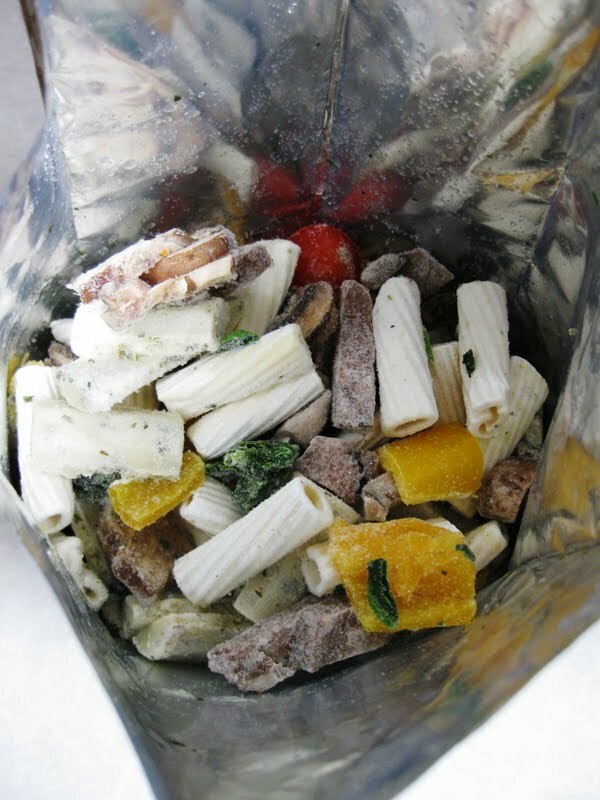 I opened up the bag, to find its contents looking pretty good for something frozen. 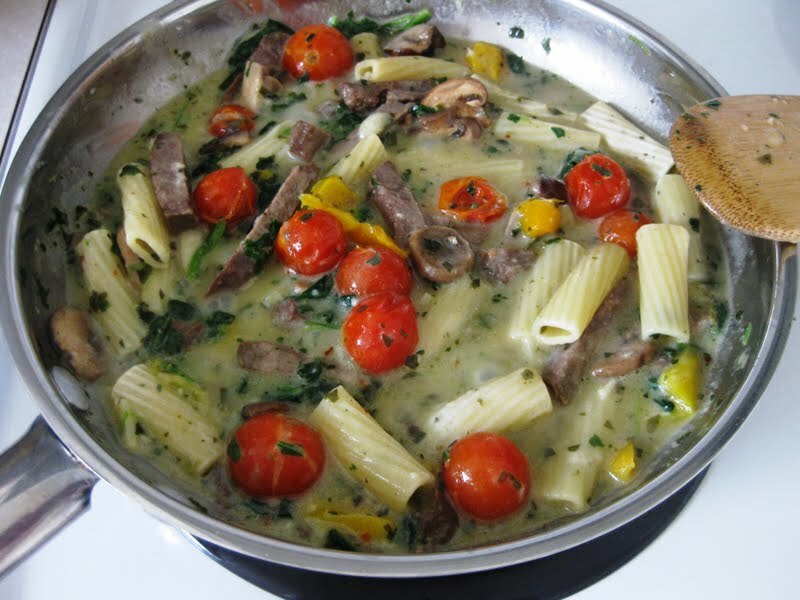 Inside were pasta, slices of steak, cherry tomatoes, slices of mushrooms, yellow pepper, and frozen chunks of herb butter (according to the website, this was olive oil, I’m not so sure about it). It was off to the skillet, to be cooked, covered for 4 minutes. Disclaimer: I decided not to use all of the noodles, so the photo below is representative of mostly steak and vegetables. At the end of 4 minutes, I gave the pasta a stir, added sliced onions, a healthy pinch of red pepper flakes, and continued to cook for 6 more minutes. It smelled quite delicious. Upon immediate inspection, I think there was too much sauce for the amount of food. But perhaps, this was because I didn’t cook all of the pasta. I was surprised how tender the steak was and how well the pasta came out. The overall taste of the sauce, unfortunately was a bit bland and needed some tweaking. 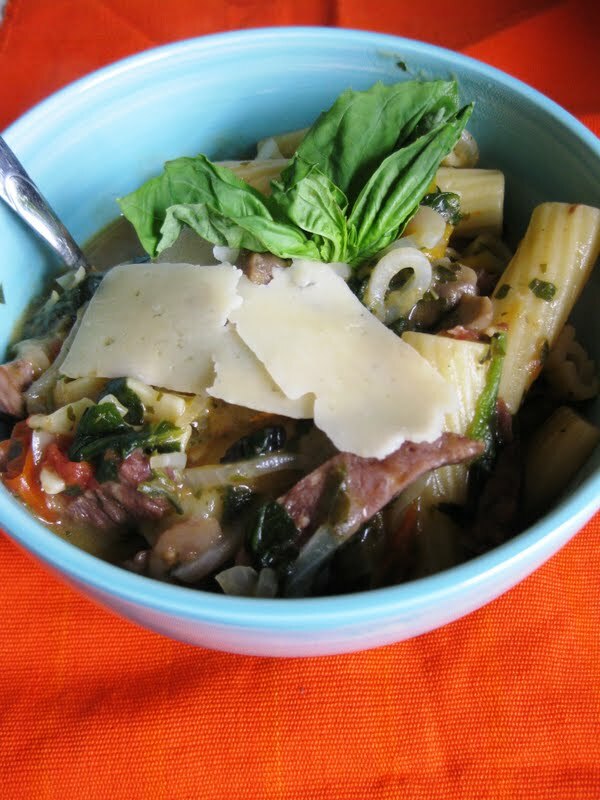 I added fresh Parmesan cheese, julienne of basil, and freshly ground pepper. This seemed to help a bit. 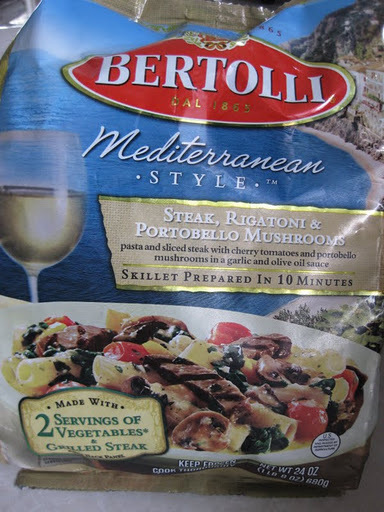 Will I buy more Bertolli frozen meals in the future? 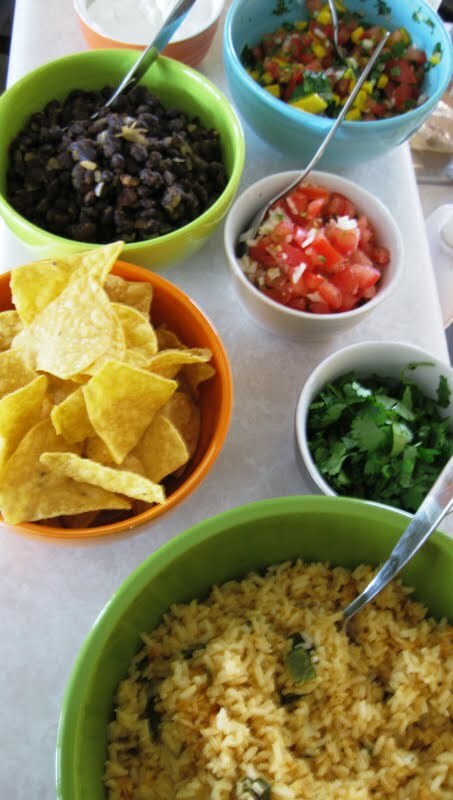 I think unlikely – I do enjoy cooking, and usually have the means, the know-how, and the time to do it. 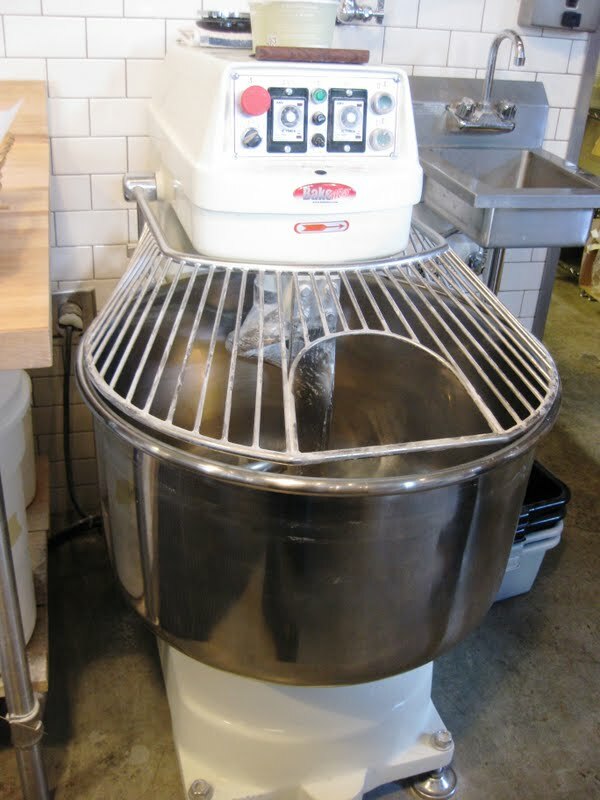 But, if you are short on time, and have to go frozen, this might be a good option for you. Bertolli really does beat a compartmental frozen TV tray meal. Let me know if you have tried this before or if you plan on trying it in the future! June’s picking up and I have more hands-on cooking classes coming up that I’ll be teaching at Whole Foods Market in Redmond, WA. As always, please sign up in advance to reserve a spot. See a class you’d like to attend but have a time conflict? Not to worry! Email me to set up a private class. Join us at the Carnation Farmers Market for Stone Soup Kitchen. We will demonstrate how to make soup from fresh stock and produce at the market. Soup will be available for sale along with fresh baked bread from a bread vendor with local butter from Golden Glen Creamery. This month we’re celebrating bees! When I think of bees, I think of honey. While honey is great in your cup of tea, it’s also excellent as a cooking ingredient. Let’s get cooking. Let’s celebrate seasonal cooking and all it has to offer! Once a month, we’ll gather in the kitchen and cook with seasonal produce. 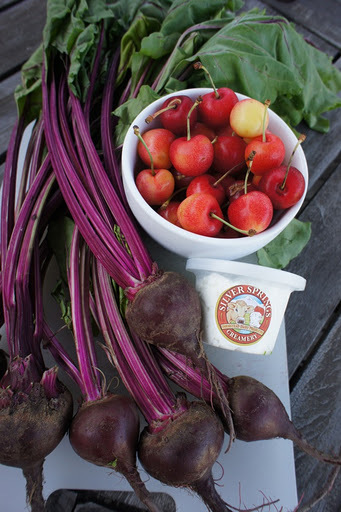 June in the Northwest puts a spotlight on beets, peas, rainbow Swiss chard, and strawberries. Have you seen the great cookbooks we carry in our Whole Body section? Today, we’ll make a handful of recipes from The Northwest Vegetarian Cookbook by Debra Daniels-Zeller. Each day we will focus on cuisine of a country. We will cover: France, Japan, Italy, Greece and India. We all have at least one in our kitchen and use it on daily basis. It might be straight, curved, or serrated. Some are shorter than others, but just as useful. Others are white (ceramic) or stainless steel. I’m talking about a knife, of course. The most useful tool in the kitchen, if used correctly. I have been teaching knife skills classes for years, and it’s my favorite class to teach. I always feel like a first grade teacher who teaches the young students how to use a pen – hold it correctly, don’t lift it off the paper, etc. Many of you have asked for a private group class, and now it is going to happen! Bring your cutting board and a knife to learn how to slice, dice, roll, fillet, and chiffonade. I will provide onions, garlic, carrots, tomatoes, bell peppers and basil. 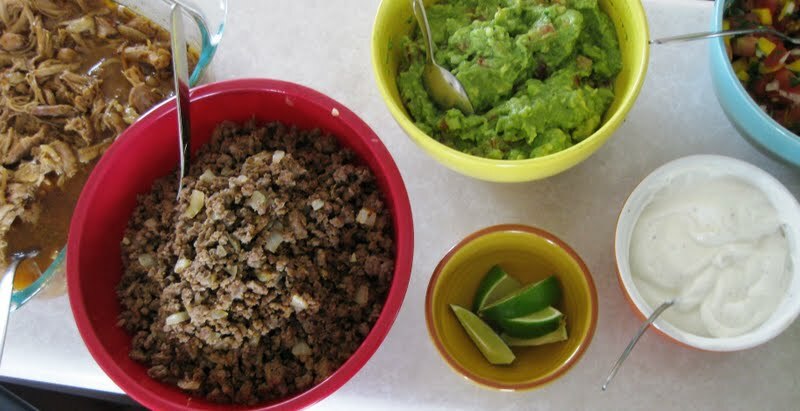 At the end of the class, I will demonstrate techniques for cutting a mango, avocado, segment an orange and mince ginger. 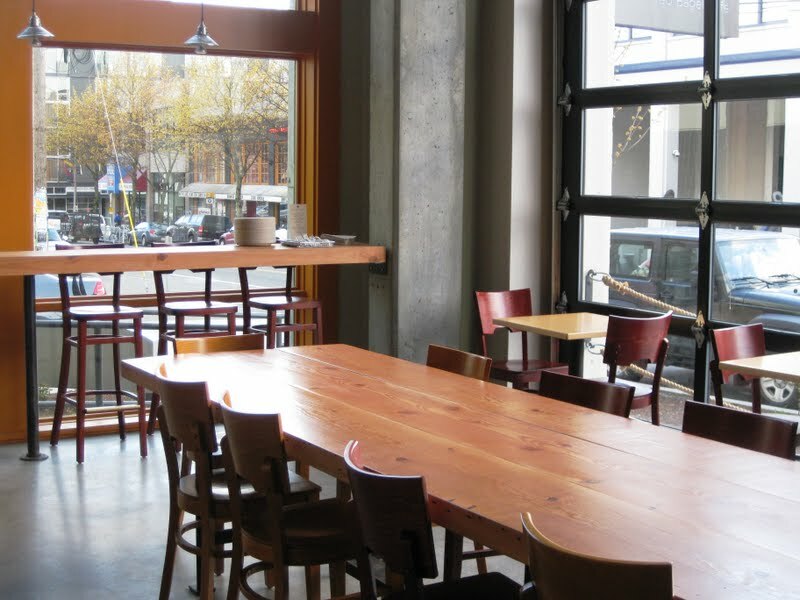 My friend, Myra Kohn of Seattle Bon Vivant will graciously host us on Sunday, June 26th for a hands-on Essential Knife Skills class. We will get started at 12pm. Plan for a 1.5-2-hour class. I will be happy to talk about knife care, sharpening, give you tips about purchasing a knife and answer any of your questions to my best ability. Please email me directly if you would like to attend.